Fan-filmed video footage of German hard rock veterans SCORPIONS performing on August 1 at the See-Rock festival in Graz, Austria can be seen below. Sitting behind the kit for the SCORPIONS on the current run of shows is Swedish drummer Johan Franzon. 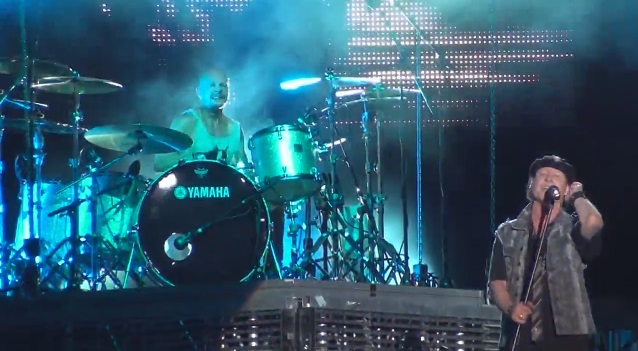 Franzon is filling in for James Kottak, the SCORPIONS' American drummer who spent a month in a Dubai, United Arab Emirates jail in April for insulting Islam and has since begun receiving treatment for alcohol abuse. Kottak said in a statement: "I am determined to come to grips with my alcoholism and am doing everything on a daily basis to beat this relentless disease." He added: "This entire incident caused me to realize that it is time to stop drinking once and for all so that I can become the father, musician, and friend that I know I can be." SCORPIONS' latest release, "MTV Unplugged", was made available in North America on January 21 via Sony International. Material for the set was taken from the band's first-ever "MTV Unplugged" show and features new acoustic versions of best-loved classic hits, as well as five brand new songs.